Remote Access (co-created with Talia Shaaked) is an audio video installation (runtime 30:00), exploring contemporary technology and user awareness. Installed at DAIMON Gallery (Gatineau, QC) in October 2016, Remote Access, was the result of a First Works Residency and Grant. Can you experience a place you will never set foot? Endless and immediate access to information, images and sound has become habitual. Our awareness of the underlying processes of technological communication is absent beyond the performative. Remote Access is an attempt to illustrate this divide. 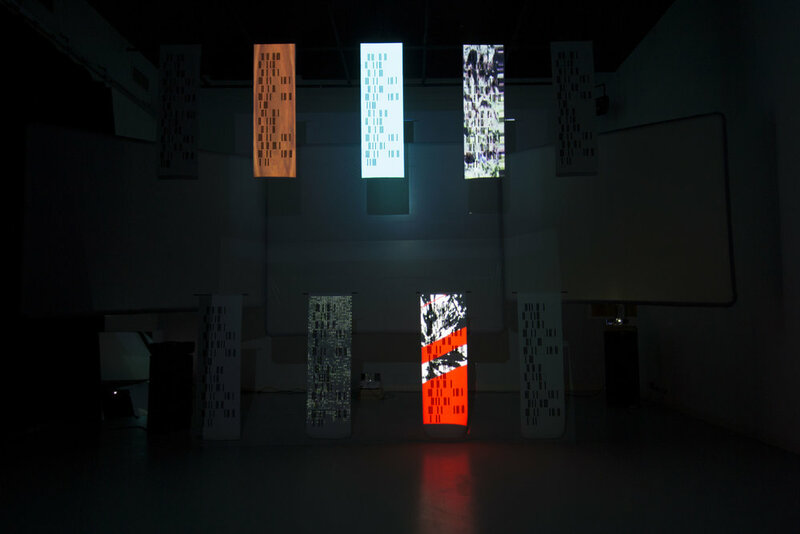 Choosing nine inaccessible locations, the piece uses binary coding of latitude and longitude to direct the sonic and visual material. Hanging banners display coordinates translated to binary, while the audio is triggered by identical data. Projections appear as a third layer, highlighting 1 of the 9 locations in sequence with the sound. The goal is not to recreate physical locations, but to translate them, offering a visualization of intangible realms between physical and digital.